We’ve been writing Red House West for about a year and a half, and the other day I was reflecting on how much it has changed the way I look at houses and spaces and design. I have a new lexicon of design terms (Anaglypta, portiere, and Gustavian – to name just a few), and a much keener eye and appreciation for design detail. 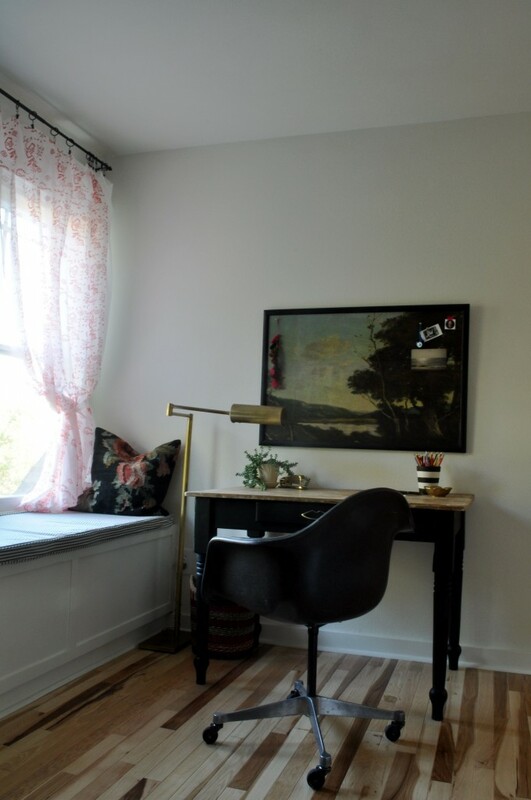 Writing posts has forced me to look critically at spaces, to analyze and verbalize just what I like about them, and to then look at designs and plans for my own home through this new lens. I no longer stop at the thought, “oh, I like that.” Now I also, almost unconsciously, itemize just why I like it. 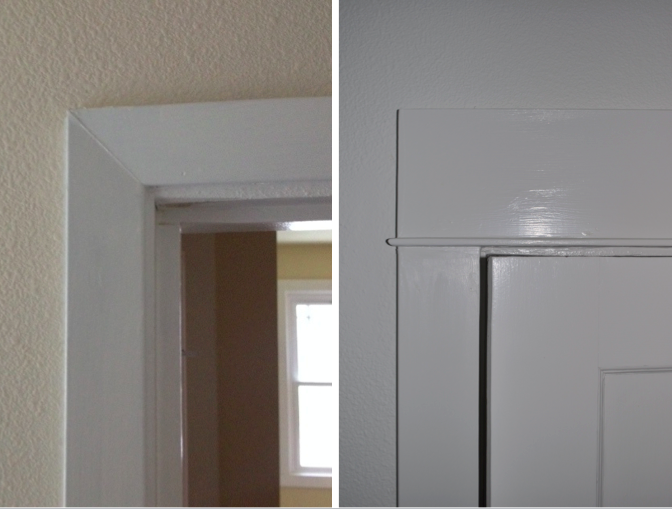 One thing that I was completely oblivious to in the dark days before RHW (BRHW) is the difference that trim or moulding can make to a space. I can’t remember ever noticing it, much less remarking on it, but now it’s one of the first things I see when looking at a room. It may not be the star of the show, but it’s one of those seemingly minor design elements that has major powers of transformation. The downstairs of our home is much more finished than the upstairs. It was remodeled twice by previous owners, and since moving in we’ve done some work of our own – including painting every room. I love the trim in our downstairs. It is substantial but simple – a perfect complement to the 1930’s farmhouse architecture. Can you spot the RHW DIYs in this photo? As we work on this house little by little, one of our major goals is to unify the upstairs with the downstairs by installing wood floors, using a cohesive paint palette, and by changing the trim. The one space we’ve tackled upstairs is the Chamber of Secrets, and I think the trim goes a long way to making that room feel well done and connected to the rest of the house. To make the trim we used a six-inch board as the lintel and four-inch boards on the sides with a one inch-wide strip sandwiched in between. We attached everything with small nails and glue, filled in the cracks with wood filler and caulk, then sanded and painted. We decided to make the baseboards thinner than the six-inch ones downstairs, so that they would seamlessly connect with the toe kick at the bottom of the bookcase and windowseat. I never would have guessed that I’d be so satisfied by such a simple change, or as excited as a I am to replace all of the upstairs trim to match the rest of the house. 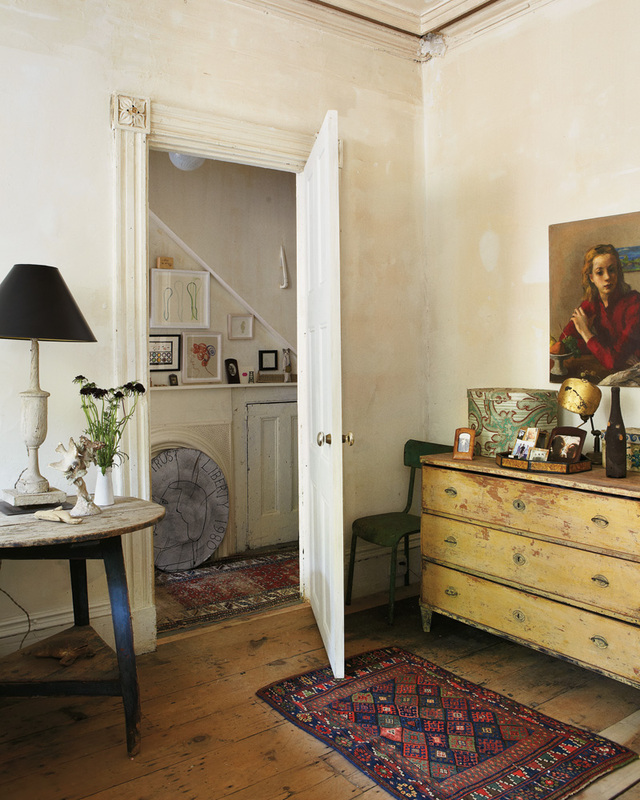 Do you have anything new on your interior design radar? Perhaps even something you didn’t notice BRHW? Have a great week! I do believe the DYI in the bedroom photo was the lamp shade? Also, can you tell me where you bought the fabric you used for the chamber secret window cushion? I waited until a combination of sale price and a ‘15% off your entire order’ coupon made it 75% off. 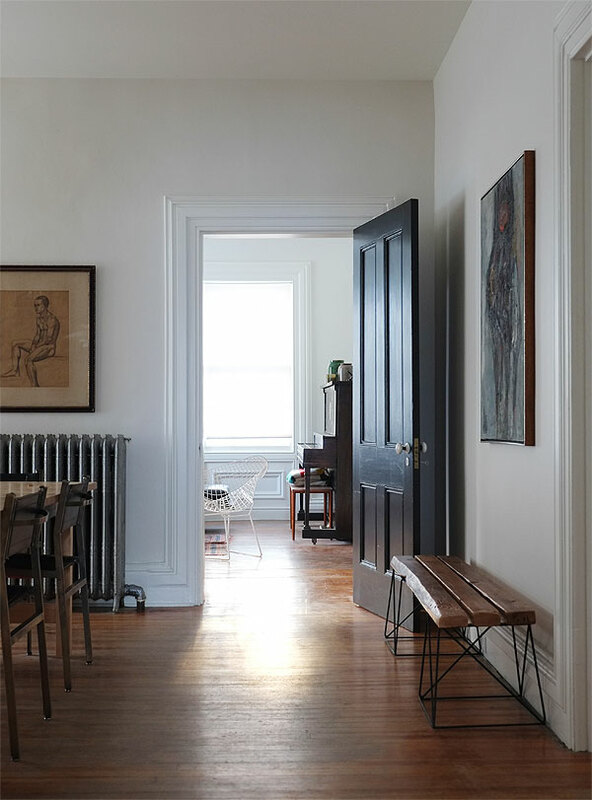 Absolutely, chunky moldings are a must. I grew up in a late 80s ranch and we had none of the good woodwork; now as my husband and I house hunt, it is at the top of my list. I like that you will be recreating the original profiles in your renovated spaces. That is definitely something I would pick out during a showing! Yep, our previous house was an 80’s ranch, and it also bore the slim-profile-flat-brown trim (and popcorn ceilings, alas). I’ve actually wondered what I’d do to update that house – I’m not sure chunky trim would look right in a ranch-style home, but there has to be a better way. Thanks Dana and happy house hunting! I would certainly be in favor of a blog post about what to do about 70s/80s ranch houses! Mine has lots of issues (crazy mudding–not popcorn or orange peel but more like pseudo-plastering), but the trim is a definite one. I feel like larger trim would overwhelm the under 8′ ceilings and I don’t know what to do. What are your thoughts about wainscoting, or wainscoting with paneling? Also, I love the Portland Craftsmen houses and one of my favorite features is picture moulding. My aunt has some, it’s fabulous. And she has short walls but a lot of them are rounded at the top, making everything feel cozy. offhand, It’s hard for me to picture wainscoting working in that context, but maybe something very streamlined and modern? We have a related problem. There is already matching trim throughout our house, but it wasn’t particularly spectacular to begin with and now is pretty beaten up and has lots of little dabs paint at the edges from multiple repaints of the walls by multiple owners. We dealt with the window trim when we replaced windows several years ago. 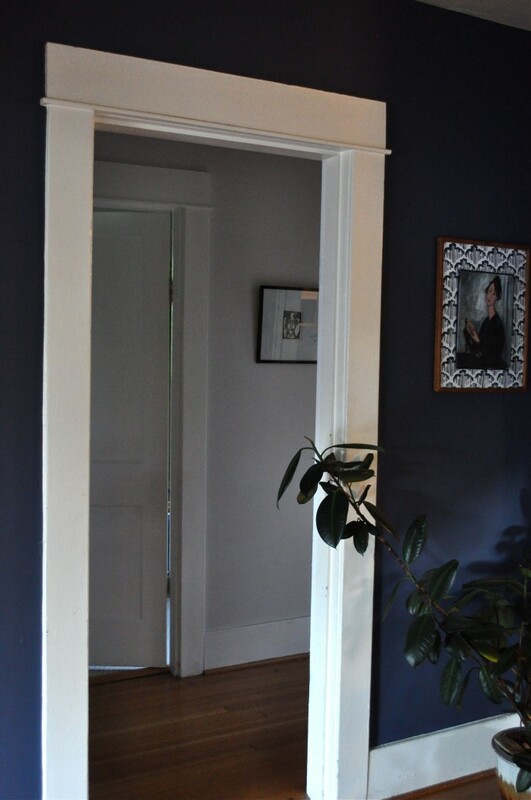 But we have been putting off replacing the baseboards and trim around the doors because the fact that it is absolutely EVERYWHERE has made the project seem to overwhelmingly large. 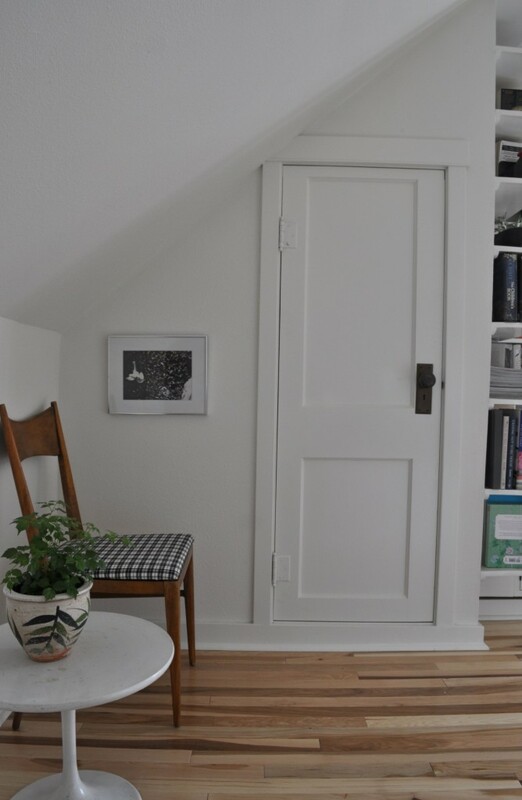 I think the one-room-at-a-time approach that you are taking with your second floor makes sense. I have bullseye rosettes in the trim around the windows and original doorways, which you see in a lot of turn of the century homes, and I love it, but it’s been bugging me that the interior doors/rooms that were built much later, when the rowhouse was converted to apartments, do not match the originial, or worse, have no trim whatsoever. I mean the massive open doorway to my kitchen? No trim, none, nada, completely naked! It looks unfinished, and it’s also a completely different height than an original doorway that is adjacent to it. 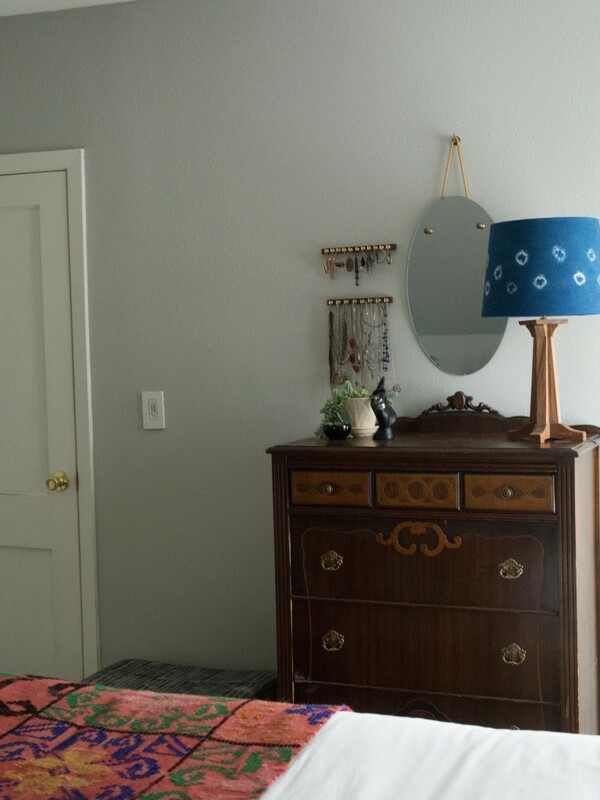 I could possibly source old trim that would match, but I’ve also considered making some kind of large curtain, maybe from recycled saris or a vintage fabric, that would give more character to the doorway, not to mention, give me the option of closing off my kitchen from my dining room. I love the trim you have downstairs, it has such a nostalgic charm, while still being timeless, the color of that wall is also gorgeous. 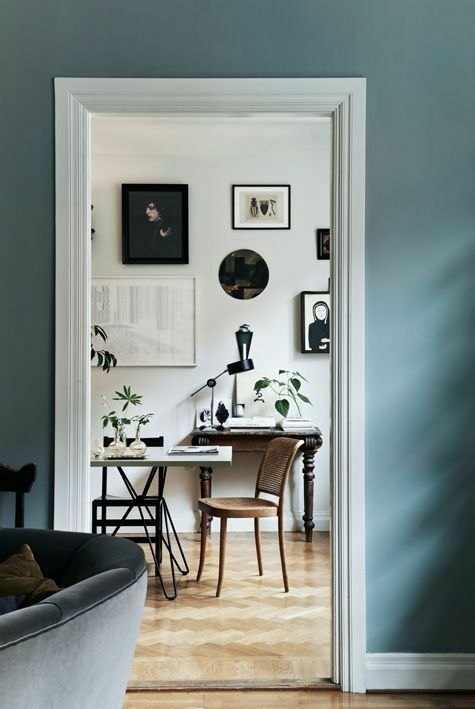 I’m really obsessed with darker, moody colors now…and after I fought so hard for eight months to make sure I had an apartment with all white walls. Oh, how my tastes are always evolving, haha.